The Brand New Heavies’ unique mix of jazz, funk and soul has lit up the UK music scene for well over two decades, and the band have been responsible for some of the UK’s biggest R&B/soul tracks. Old school friends Jan Kincaid, Simon Bartholomew and Andrew Levy had a near-obsessive love of soul and funk that inspired them to form a band. The Brand New Heavies translated that love for the funk grooves of the 1970s into a sophisticated sound that carried the torch for classic soul. Eventually adding a brass section, the Brand New Heavies built a cult following throughout the London club circuit, surviving the shift that saw the rare groove scene fade in the wake of acid house. A single, ‘Got to Give’, came out on Cooltempo before the Brand New Heavies signed to Acid Jazz Records and released ‘Brand New Heavies’ to critical acclaim. After signing to a division of Chrysalis Records, a revamped version of the first album, with vocals by N'Dea Davenport was released, and the singles ‘Dream Come True’, ‘Never Stop’ and ‘Stay This Way’, became hits on both sides of the Atlantic. These original chunks of organic funk earned the band a reputation as a formidable live act and their reinterpretations of popular standards, such as ‘Midnight At The Oasis’, Carole King's ‘You've Got A Friend’ and the Stevie Wonder classic ‘I Don't Know Why (I Love You)’, brought major global chart success. The group's appearance with MC Serch and Q-Tip at a performance in New York City inspired the group to incorporate elements of hip hop music. Their next album was the critically acclaimed Heavy Rhyme Experience, Vol. 1, which included collaborations with Guru of Gang Starr and The Pharcyde, among others. Having made their mark originally with the immensely talented vocalist N’Dea Davenport, the band were later fronted by Siedah Garrett and Carleen Anderson and their current vocalist is British singer Sulene Fleming. In total, they've scored sixteen Top 40 singles, as well as over two million album sales. Brand New Heavies play at The Apex is on Saturday 20 April at 8pm. 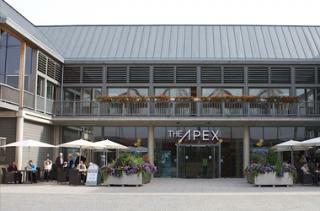 Tickets are £28.50, ring the box office on 01284 758000 or see www.theapex.co.uk for details.